Finely chop 1 cup of the mushrooms. In medium bowl, mix chopped mushrooms, beef, bread crumbs, egg product, milk, thyme and 1 tablespoon of the ketchup. Shape mixture into 5 oval patties, 1/2 inch thick. In 12-inch nonstick skillet, heat oil over medium-high heat. Add patties; cook about 5 minutes, turning once, until browned. 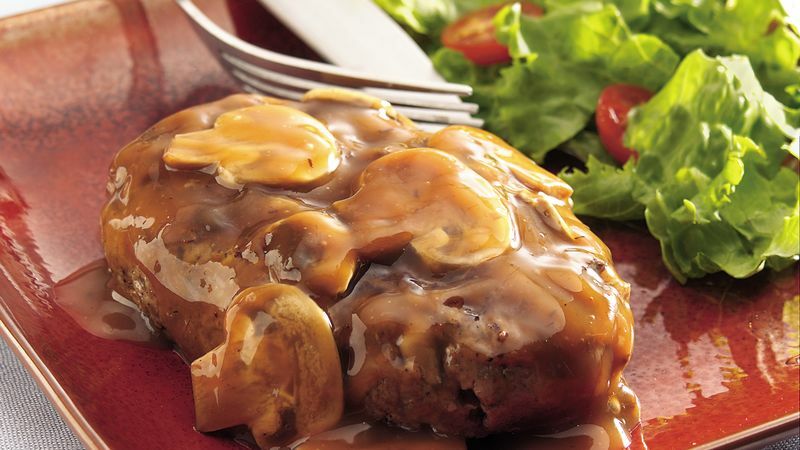 Add remaining sliced mushrooms, 2 tablespoons ketchup and the gravy. Heat to boiling; reduce heat to low. Cover; cook 5 to 10 minutes or until meat thermometer inserted in center of patties reads 160°F and patties are no longer pink in center. Round out this homey meal with a side of steamed green beans and a simple mixed-greens salad. Garnish with a sprig of fresh thyme for a splash of color and flavor.